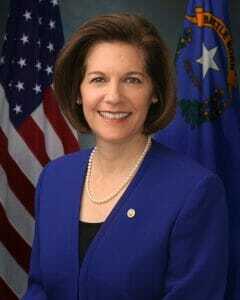 Democratic Sen. Catherine Cortez Masto said today she will vote against U.S. Supreme Court nominee Neil Gorsuch, who has “refused” to honor her request to meet with him over the past several weeks. The junior senator from Nevada said she supported “full consideration” of Gorsuch, read his Tenth Circuit opinions and dissents, reviewed his private practice cases, watched his confirmation hearings and requested a one on one meeting with him. But her spokesman said that he has not done so despite her attempts to schedule a meeting with him and that her office was asked to make an argument for why the Supreme Court nominee should meet with her. Cortez Masto will also vote no on cloture on Gorsuch’s nomination — required to overcome a filibuster and proceed to the final vote. She said that she believes that a “nominee of such importance” should require 60 votes to be confirmed, in line with what Senate Democratic Leader Chuck Schumer has said.